I have been involved in the puppet ministry for about 20 years. I have many different puppets and many voices to go with them. I have used the puppet ministry for church services, revivals, youth camps, senior adult camps, ladies meetings, vacation Bible school, drug rehabs, and schools that will allow us in to minister. I have found over the years that adults enjoy the puppets as much if not sometimes more than the children. Puppets are an awesome tool that you can use to share the joy and the love of God in a simple way, yet on a level for children and adults. 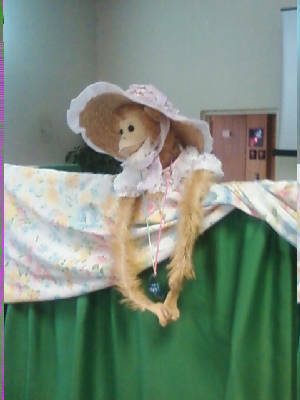 If you have need of some fun and would like to have me come and minister to your church with the puppet ministry, please contact me and we would love to come and minister to your church. The Bible says that laughter doeth good like a medicine and at this time in the world and peoples lives, we could all use a little more laughter. You can see puppet videos on YouTube. Just type in Debbie Domer and there will be several videos there some from youth camps. Tiffany s probably everyones favorite character. She is loved by all ages.